If you’ve tried to take a break from drinking, you know it feels like there are countless obstacles in your way: socializing with friends, driving past the liquor store on the way home from work, a spouse that likes to have a glass of wine in the evening — the list goes on and on. You absolutely have to pay attention to these obstacles. I see so many people get way too focused on the end result that they want — a changed approach to drinking — rather than focusing on the process of how they’re going to get there. On this episode, I’m talking about how to change your mindset around confronting obstacles. Instead of being surprised by the challenges that pop up, you can anticipate and solve them ahead of time. 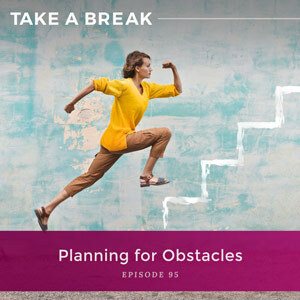 I break this process down into three steps that will help you make a game plan for dealing with any kind of obstacle. Why so many people want to skip over the process of change and go straight to their desired result. Why the key to change is focusing on the process of handling obstacles over and over again. How your thoughts are impeding you from overcoming obstacles, and how you can change your thoughts so they become a tool instead of a hindrance. A list of obstacles that can get you thinking about what challenges you might face in your daily journey to change your drinking. Why anticipating and planning ahead for obstacles is one of the most important and powerful steps in the process of change. The three steps for overcoming obstacles and how they will help you respond to challenges as your best self. 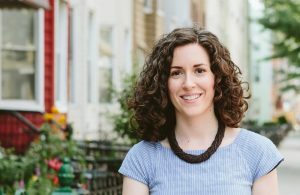 You are listening to the Take A Break podcast with Rachel Hart, episode 95.Welcome to the Take A Break podcast with Rachel Hart. If you are an alcoholic or an addict, this is not the show for you, but if you are someone who has a highly functioning life, doing very well, but just drinking a bit too much and wants to take a break, then welcome to the show. Let’s get started. Well, hello everybody. Hey, I’m not kidding, I am sitting here at my desk wearing sunglasses. I know it seems so crazy but I moved my desk when the baby was born into another room and so I’m right up against the window and right now the sun is shining in, and it’s so bright that I had to put sunglasses on. So this is a first. I’m recording a podcast for you guys wearing sunglasses. Very strange. Alright, so today we are talking about obstacles to changing your drinking, obstacles to saying no when that desire, when that urge to drink appears. I don’t care if you’re trying to take a break from drinking or you want to drink less, you have got to pay attention to your obstacles if you are going to be successful. That is what most people do when they embark on change. They fixate on how hard it will be, they catastrophize, they doubt, and they undermine themselves. What I want you to do is something very different when you’re embarking on change, and that is understanding how to solve your obstacles ahead of time. Because what happens if you don’t do this? If you finally gear yourself to take action, if you finally gear yourself up and you say okay, I’m taking a break, you become so focused on that result that you miss the process of change, and the process of change requires overcoming hurdles, overcoming things that are getting in the way. Your mental energy ends up being all about where you want to end up and you spend very little mental resources on how you’re going to get there. And the how you’re going to get there is the key. And that’s what I want to talk to you about. How are you going to get there? How do you get the end result that you want? You do that by anticipating obstacles ahead of time and solving them ahead of time. It is the number one thing across the board that I watch my clients fail to do. They don’t anticipate, they don’t plan, they don’t solve ahead of time, and then their obstacles, they run into them and they’re like, surprised that they’re there. It’s like, “I had no idea that I was going to get invited out to happy hour, what was I supposed to do, Rachel?” You get surprised that the obstacle is there. The obstacles, if you don’t plan for them ahead of time, if you don’t solve them ahead of time, this will be what will get in the way of getting you where you want to go, which is to be in a place where you have changed this habit. Okay, let’s talk about obstacles. Obstacle is just something that impedes progress or achievement of your goal. And guess what that something is? It’s you. You’re what’s impeding your progress or your achievement. The only thing that impedes getting what you want, changing the habit of drinking is the thoughts in your head. Now, this is good news because you’re the only thing in the world that you have power over. The thoughts in your head are the only thoughts in the world that you can change. You can’t change your sister’s or your boss’s or your mother’s or your spouse’s, but you can change your thoughts. And so all of this is really good news because when you see that an obstacle is really just you, well, you just really have to learn how to start thinking in a different way. It requires a mindset shift. And when you are drinking more than you want, it feels like the opposite. It feels like the obstacles are totally outside of your control, right? It’s everybody else who drinks, it’s having to go on this vacation to the Caribbean that’s all-inclusive and booze is going to be everywhere. The obstacle is my husband and the fact that he still drinks, the obstacle is my job and the fact that it’s so stressful. That’s what we believe. We believe the obstacles are external to us. In that case, we don’t have any control over them. We just got to hide out, we got to isolate, we got to go to our cabin in the woods, right? I wanted to do that for a long time. Cabin in the woods. Not so sustainable. So what we end up doing is we feel like we’re drinking against our own will because, well, we don’t have any control over these obstacles and what else am I supposed to do? I can’t control them if I can’t stop my husband from drinking and if I can’t make it so the resort doesn’t offer a drink every step of the way. I’ve been to one of those all-inclusive resorts. They’re crazy. They put like, wristbands on you. Have you been? And how much you can drink, it’s really crazy, especially when I went and I wasn’t drinking. It’s kind of fascinating. Anyway, we feel like we’re drinking against our own will. And then what happens? We wake up the next day and we have a hangover and we’re like, what happened? I wasn’t going to drink last night. I was saying no. Oh god, it’s because I ran into that obstacle, and that obstacle is impossible. What else could I have done? It’s only because you haven’t learned to manage your mind or manage your urges, and part of learning how to manage your mind is anticipating and planning for obstacles ahead of time. That is why we do this planning piece. When you plan how to handle an obstacle before you encounter it, you get to strategize and solve it from a place of peace. You aren’t in the moment. You aren’t in that moment feeling insecure or awkward or bored or deprived. You’re just calm and logical and rational and can think about, hey, how would my best self handle this obstacle? Oh, this is what we’re going to do. Okay, so there are three steps. One, you have to anticipate what’s going to get in the way of the result that you want. Two, you have to decide how you’re going to handle that obstacle, and three, you have to write down your plan. So step one is anticipating, and I want you to consider everything. If you want to change your drinking, if you want to take a break, what is going to get in the way? Is it five o clock? Is it every time you come home? Is it stopping by the liquor store on the way home? Is it seeing that wine is on sale when you’re doing a grocery run? Is it feeling an urge? Is it hanging out with your friends? Is it watching your husband drink? Is it going to parties? Is it socializing? Is it people asking you questions? Is it eating out at restaurants? Is it last minute invitations to happy hour? Is it traveling? Is it holidays? Is it vacations? What is going to get in the way? Well, if you plan how to anticipate and handle and strategize these obstacles ahead of time, you will know what you’re supposed to do in the moment. You won’t be caught off guard. And the reason that it’s ever difficult in the moment to say no to a drink is always because of an emotion. It’s always because you’ll feel bored or restless or insecure or awkward or like you’re missing out or deprived or lonely. That is always why it’s difficult, because your brain has learned how to use alcohol to cover up how you feel. So when you’re trying to change the habit, negative emotions are going to be the very first challenge. So what are you going to do when you feel bored? What are you going to do when you feel restless? How are you going to handle that? What about when you feel awkward or deprived? What are you going to tell yourself? This is the mindset shift because you’re planning ahead of time how you will respond. You need to ask yourself, why will you want to say yes to a drink in that moment? Whatever that moment is, whatever that obstacle is, why will you want to say yes? Because it’s comfortable, because it’s easy, because you’re tired, because you want to blend in, because you hate rules, because you hate restriction, you don’t want to feel deprived, you don’t want to feel judged. Just ask yourself why will you want to say yes. Why in that moment will you not want to follow through with what you have committed to? Really put yourself – really step into those shoes. And once you have answered that, then what would your best self do when she was tired, when everybody around her was drinking? When she was at a party? What would that best version of yourself do? This is the answer for how you’re going to handle your obstacles. You also want to consider your history and your patterns with change. Your history and your patterns for trying to change habits because you know yourself best. What has happened before when you have tried to change your drinking? Did you sabotage yourself? Did you rebel? Did you get frustrated the moment you didn’t do it perfectly? Did you throw in the towel? Did you lose interest? Did you start out super strong and then lose enthusiasm? Study yourself. Look back at past attempts. Mine those past attempts for data. And then ask yourself, okay, so if I know I’ve sabotaged myself in the past, if I know that I get really frustrated when I don’t do things perfectly, how am I going to handle those obstacles? Now that I’m in this place of calm and peace and logic, how do I want to handle them? Once you have listed out all your obstacles, that is step one. Step two is planning how you want to handle them, and that’s really important. Most of you are not anticipating obstacles ahead of time. Suddenly they appear in the moment, you’re totally flabbergasted that that obstacle is there, you haven’t made a plan and then you decide to drink. It is going to be so much more challenging if you don’t plan ahead. So you need to plan now when you’re calm, when you’re rational, how to handle each. I think asking yourself, what would my best self do? What would the best version of myself say? How would they show up in this moment? Trying to do this in the moment will be very challenging. It will be because you’ll just want to grab a drink and forget about your goal, forget about what you’re aiming towards. Doing this ahead of time means that when your obstacle appears, it’s already solved. When you get invited to that last-minute happy hour, you’ll know how you want to respond. Maybe you don’t want to go, maybe you know you’re going to order a seltzer, maybe you’re going to return to your compelling reason before you head into the bar. You will know what your plan is ahead of time. And then the last step, and if you listen to the podcast, you hear me talk about this all the time. Write it down. Write all of this down. Write down your plan. Get specific. You can even really visualize being in the situation. Visualize being at the party and not drinking and handling it the way you want to. Visualize going home for the holidays, not drinking, handling it the way you want to. Visualize going on that first date, not drinking, and showing up the way you want to. That really is the power. It’s like you’re preparing your brain, this is what we’re going to do, this is how we’re going to handle it, this is what I’m going to say, this is what I’m going to try to feel, this is how I’m going to act, these are all the steps that I’m going to take. It really is doing that work of preparation ahead of time. All of this, all of this work around obstacles is about focusing on the process of change. Not just the end game. Yes, I know you want to get to a place in your life where drinking is not an issue for you, where you don’t have to worry about the habit anymore, where you’re not waking up feeling hungover, you’re not waking up with the regret, you don’t have to deal with the shame. But in order to get to that place, in order to get to that end goal, you’ve got to figure out the process of getting there. And the process is always meeting your obstacles head on over and over and over again. It’s not hiding out. It’s not isolating. It’s not insulating yourself. It is meeting your obstacles, not being afraid of them, knowing that you can handle that moment differently. If you’ve taught yourself that every time you go out on a date, the way to get through it, the way to meet someone new and feel comfortable is to drink, it’s going on a date and not drinking. It is meeting that discomfort head on because of course, discomfort is the path. That is how you train your brain to do something new. When you do this, you will meet yourself over and over and over again. You will meet your thoughts, you will meet all your justifications, all your excuses, all your worries, all your doubts. You’ll meet it over and over again. Every time you want to say, “Just this once, it doesn’t matter, who cares, I can’t handle how I feel right now,” but change is the process of meeting yourself and evolving, and that evolution comes from doing something different. So that really is – it’s a short and sweet podcast today but this is a very simple step that so many people just blow right past. Anticipate the obstacles that are going to get in the way and anticipate all of them. Decide ahead of time how you will handle them. Plan from a space when you are calm, when you are rational, when you are logical. If you try to do it in the moment, in that moment, you’re just going to want to say yes because that is what your brain has practiced doing. And then write down your plan. Put it on paper. Why do we put it on paper? Because the brain wants things to be easy. The brain’s like, yeah, yeah, yeah, I got it. But when you write things out, you are helping your brain memorize, you are helping your brain remember what it is going to do. This is so simple, this work, but it’s a step that almost everyone overlooks and I promise – here’s the best part – learning how to plan, anticipate, and solve your obstacles ahead of time, learning how to do this with drinking is fantastic, but guess what? You can apply this to anything you want to change in your life. Finding the obstacles, planning ahead of time how you’re going to solve them, because then the decision’s already made. You don’t need to make a decision in the moment and writing it down. So simple. So simple, so easy, make sure you do it. It will change everything. Alright everybody, that’s it for this week. I love hearing from you guys, so if you have ideas or questions, you can always email me at podcast@rachelhart.com. Otherwise, I will see you next Tuesday. Hey guys, if you’re finding this podcast helpful, and I really hope you are, I would love if you head on over to iTunes and leave a review. And as a special thank you, I’ve updated and expanded my free urge meditation giveaway. I’ve created two audio meditations plus a brand-new workbook that will teach you a different way to respond to the urge to drink. The meditations are super simple. All it takes is five minutes and a pair of headphones. And each one now comes with a follow-up exercise in the workbook to help you dig deeper and really retrain your brain when it comes to the habit of drinking. So after you leave a review on iTunes, all you need to do is head on over to rachelhart.com/urge, input your information, and I’ll make sure you get a copy of both meditations plus the workbook in your inbox.